Sequoyah Caverns is closing real soon. Make plans to see it now if you want to ever see it. More details below. The Ellis Family moved to this area of land along the base of Sand Mountain in DeKalb County, AL in 1841 and decendants have lived here ever since. Friends and family explored "Ellis Cave" and over the yeard found several Cherokee artifacts. One of the names inscribed on the interior wall is "Sam Houston, 1830" and while nobody can be certain if it's the famous Sam Houston, he lived with the Cherokee for a while and is said to have married one of Sequoyah's daughters. It is only speculation that Sequoyah ever visited here. The owners of the cave didn't work towards opening the cave commercially until the early 1960's. Clark Byers was the famous Rock City barn painter and after he retired from that, he looked to operate the cave as a tourist attraction. Just as he had done with Rock City, he painted a few barns advertising Sequoyah Caverns. (I have found 8 of them.) Byers spent a year installing walkways, handrails and lighting before they opened in 1964. What sets this cave apart from the others I've been to are the pools of water, along with the lighting. 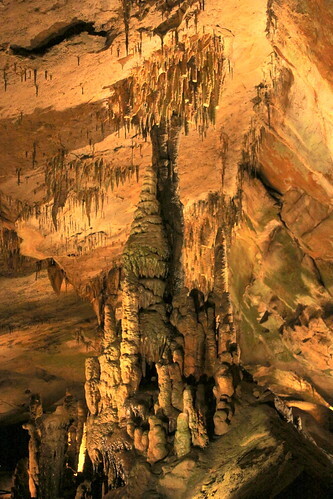 Ranging from the size of puddles to a lake in the center, the water, even though it is usually not very deep, reflects the ceiling to make the cave look even bigger and more spectacular. At one time, the cave was known as "Looking Glass Ceverns." The owner is looking to retire soon. I spoke with him for a bit before taking the tour. The last day they will be open is on Labor Day, September 2, 2013. The cave is not for sale as the owner wants the property to stay with the family. (In fact, someone wanting to buy the cave called while I was there.) As he put it, the only way the cave will ever reopen is if one of the grandkids decide they want to operate it, but they're all about college aged right now and not interested. If this kind of thing interests you, now is your chance to see it.